The standards of industrialized food production were called into question recently when details about “pink slime,” the ammonia-treated animal bits used as filler in most ground beef sold in supermarkets, came to light. The stuff is pretty much indisputably disgusting. 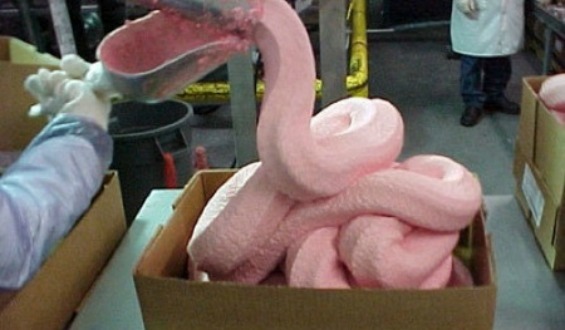 Since the media revealed to Americans just what they have been nomming on every time they devour a Big Mac (hint: it rhymes with schmat and schmonnective tissue), pink slime’s biggest producer has taken a financial hit. Beef Products, Inc. has had to suspend production at three out of its four plants, affecting over six hundred jobs. Obviously, nobody wants to see jobs disappear. But nobody wants their kid to be served a burger that’s 25% pink slime for lunch at school, either. I wasn’t aware of the slime debate in 1984 for a couple of reasons. First, I wasn’t born. Second, even after I was born and of the Nickelodeon-watching age, my parents didn’t allow me to watch You Can’t Do That On Television, the most slime-happy show of all. Apparently, they deemed the dumping of slime on unsuspecting kids to be inappropriate. If only American supermarkets had the discretion of my parents. When it comes to slime consumption, most chains seem to have had the parental controls disabled until this past week. Yes, this type of slime is pink, not green. (And yes, this analogy is getting a little out of hand.) But I’d much rather accidentally ingest the green Nickelodeon stuff, which is apparently just a combination of water, Jell-O powder, and flour. It’s my hope that this pink slime scandal will result in individual Americans evaluating their meat-purchasing decisions and coming to the conclusion that buying ground beef from Who Knows Where is just not worth it.